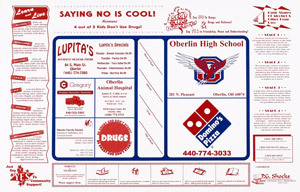 Book covers prolong the life of the textbooks in your school and create school spirit. Not only will your school save on replacing damaged books, but also promote positive messages to the students. Drug prevention/anti-violence themed book covers provide positive reinforcements daily to your students while helping them keep their work organized. 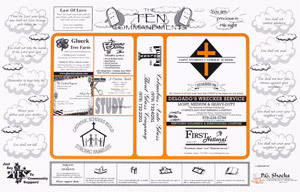 Ten commandment book covers grace your students with spiritual values on a daily basis. Available in Catholic and Lutheran versions.